Health, Music, & Sleigh Repair! 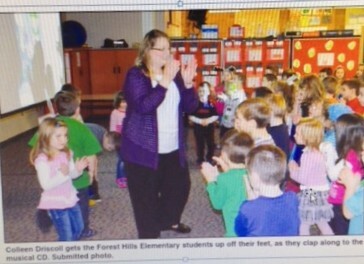 Colleen Driscoll enjoys visiting classrooms and meeting students. Her goal is to inspire students to use their creative talents and to show them the importance of striving to do their best work. 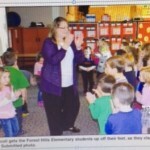 Colleen tailors presentations to the age level of the students and the needs of the teacher or school. She is available to give presentations to libraries, bookstores, book festivals, conferences, and virtual classroom visits. The recommended audience for the Piper the Elf series is grades pre-K through fifth grade. 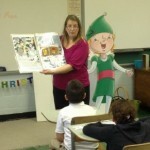 Driscoll offers a reading of her picture books as well as an engaging, interactive activity. For middle grades she discusses the writing process (including the importance of editing and re-editing) and concludes with a question and answer session. 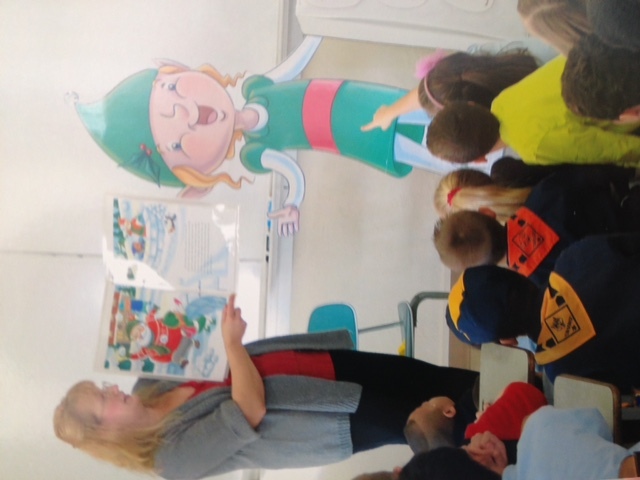 Piper the Elf Trains Santa: The interactive activity is exercising with holiday songs to show children how exercising can be fun. We discuss healthy eating and the food chart. Optional classroom activities include making recipes from the book. Piper the Elf and Santa’s Rockin’ Band: The interactive activity is dancing to the tune of Six Dancing Elves, which is an original song in Piper the Elf’s audio CD. We discuss the importance of including others, identifying when students are timid in asking to join a group, and show that we all can partake in an activity in some means. We also discuss different musical instruments. Piper the Elf’s Big Surprise: The interactive activity is using body percussion to create sounds from construction tools and using them to play secular Christmas tunes. We discuss building/repairing and the importance of sacrificing to help others. Award-winning author Colleen Driscoll is a graduate of Indiana University of Pennsylvania. Her books, Piper the Elf Trains Santa, Piper the Elf and Santa’s Rockin’ Band, and Piper the Elf’s Big Surprise are Mom’s Choice Award recipients. The Driscoll family recorded the companion Piper the Elf audio books with original music. Colleen especially enjoys meeting her fans and inspiring others to write. 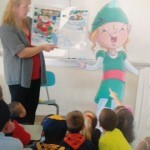 She is part of the Headline Kids School Show Program and visits schools regularly. For more information visit www.PiperTheElf.com.